Growing up in a far flung part of the country, the railway was a bit of a lifeline to the civilised world. Back along, the roads weren’t so good and leaving Cornwall was not for the faint hearted. Thankfully, we’ve always had a mainline train service that carried us up to Plymouth, Exeter and even London. Three cheers for Isambard Kingdom Brunel and his Great Western Railway! We were able to visit geographically distant relatives in East Anglia and Scotland without too much trouble, thanks to the train. We also got to take in some pretty gorgeous countryside on the way. This is all well and good, but what’s this got to do with pasties you may be wondering? Well, Great Western Railway (GWR) challenged me to make a Cornish Pasty to mark the Great Cornish Food Festival (GCFF) last month. GWR serve a variety of Cornish and other South West products on their trains. It was also the key sponsor for this year’s GCFF. This is a not to be missed event in the Cornish food calendar and if you follow me on social media, you will know I made the trip down to Truro to ‘get the vibe”. For a taste of what it was like, take a look at CT’s guest post on a previous year’s festival. I was sent a hamper with some of the aforementioned products which CT and I made short shrift of. I found Cornwall’s very own home grown tea from the Tregothnan Estate, a packet of Mr Filbert’s mixed nuts with Cornish Sea Salt and a lovely box of homemade Cornish fairings along with some saffron cakes. Amongst the other goodies, I was pleased to see two bottles of sparkling drinks from our favourite ginger beer maker, Luscombe and a bottle of Admiral’s Ale which made a fine accompaniment to our pasties. A GWR apron and a copy of Mitch Tonks’ My Little Black Book of Seafood were also included. So to the pasty. 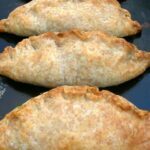 A traditional Cornish pasty is a pastry case filled with a cheap cut of beef steak, onion, floury potatoes and swede, usually referred to as turnip in these ‘ere parts. Traditionally, it had a ridged seal running along the top; this acted as a disposable handle for the miners so they could eat the pasty without contaminating it with the toxic metals on their hands. Being a vegetarian, making such a pasty was out for me, though CT and my mother would have been delighted. As it’s pumpkin season, I reckoned I’d make some vegetarian squash chilli chard feta pasties – proper job! What a good idea that was. I’d already gone completely off piste with the challenge, so I thought I’d make my ab fab flaky pastry once again. It’s just too good not to use. My one concession to the Cornish nature of the pasty was to make the pastry ridge across the top rather than along the side. This is much trickier to get right; I approached the business of filling with due care and attention and luckily pulled it off. Nevertheless, I insisted CT wash his hands before eating one. ‘Tis a pasty, but not as we know um, Jago”. A tasty autumnal pasty filled with colourful seasonal veg and a bit of spice to keep out the chill. The dough is malleable and easy to use and makes for a wonderfully buttery and flaky pastry. Fry the pumpkin with the olive oil in a large pan for 5 minutes or so. Add the garlic, chilli and sage and stir fry for a couple of minutes. Add the chard stalks and stir fry for another couple of minutes, then add the chard greens, tamiri and pepper. Put a lid on the pan and cook gently for 5 minutes. You may need a splash of water if it's looking too dry. Take off the heat, allow to cool, then crumble in the feta cheese, add a squeeze of lemon juice and stir. Roll out on a floured surface to about 2mm thick. Cut into 6 circles using a 17cm side plate as a guide, gathering the unused bits and re-rolling as necessary. Place a couple of heaped tbsp of the filling in the middle of the circles and bring the sides up around it to meet in the middle. You want a well stuffed pasty, so add a little more filling if you think it can take it. Crimp the pastry together with your fingers in true Cornish fashion. Place on a buttered baking tray and bake for 20-25 minutes when the pastry should be golden on top and crisp underneath. Makes 6 x 17cm pasties. I’m sending these squash, chilli chard feta pasties off to Jac at Tinned Tomatoes for Meat Free Mondays. The pasties were delicious served hot with a good serving of steamed kale. I managed to pack a fair amount of veg into these pasties, so I’m sharing them with Extra Veg. This is hosted at Veggie Desserts this month. As these provided three days worth of meals for the three of us, these vegetarian pasties are also being shared with Cook Once Eat Twice over at Searching for Spice. We had them two days running and the other two are sitting in the freezer waiting to be eaten at some future date. Thanks for visiting Tin and Thyme. If you make these squash, chill chard feta pasties, I’d love to hear about it in the comments below or via social media. Do share a photo on social media too and use the hashtag #tinandthyme, so I can spot it. For more delicious and nutritious recipes, follow me on Twitter, Facebook, Instagram or Pinterest. Disclaimer: I was sent a hamper of snacks and a shopping voucher in order to buy the ingredients needed for this recipe. I was not required to write a positive review and as always, all opinions are my own. I popped along to the Food Festival and it was fab to see so many people and such great local produce! Ah, my mother would agree with you entirely Annabel, I think she is addicted to the true Cornish pasty. It was great to see the festival thriving and so much on offer. Oh how lovely, the colours are wonderful, the pastry looks delicious. That hamper looks good too. I must try that Cornish tea. Now I’ve discovered my wonderful pastry Kath, there is no stopping me. It was a rare thing indeed for me to make before and as for pasties? No way. The only tea grown in the UK just has to be tried. Those look wonderful – such delicious autumn flavours. Thanks Helen. I have to say they were scrumptious. Luckily, I put a couple in the freezer, so there are more to enjoy. I love this seasonal pumpkin cheese filling even more, Choclette. These look scrumptious. What a great way to use pumpkin. I love the swiss chard in this too. Thanks Dannii. Chard is a much underrated vegetable I reckon. How lovely! That filling looks so scrummy, great combination of flavours, and I’m a recent spelt flour convert so these are right up my street! Can’t beat a good pasty. Thanks for linking to my cheese & onion pasties! Thanks Kate. I used to hate making pastry until I started using this recipe. It’s just so easy to use and always turns out beautifully flaky. Spelt is such a lovely flour – I’ve been using it for years. I love Cornish pastry, they turned out so yummy! How delicious, pumpkins would make great pasties. Some lovely looking goodies in your hamper too. I’ve not made any pasties for ages and now you’ve psyched me up to have a bash using dairy free pastry and maybe some soya mince. I always love the story about the crinkly bit being because of the tin miners! Dairy free pastry might be my next challenge Sarah. I only found a fail safe pastry recipe about a year ago, so finding a dairy free one might be the next step. Ah thank you. I can’t vouch for that, but CT said he enjoyed it just as much as he would have done a steak pasty, but I guess he had to say that! 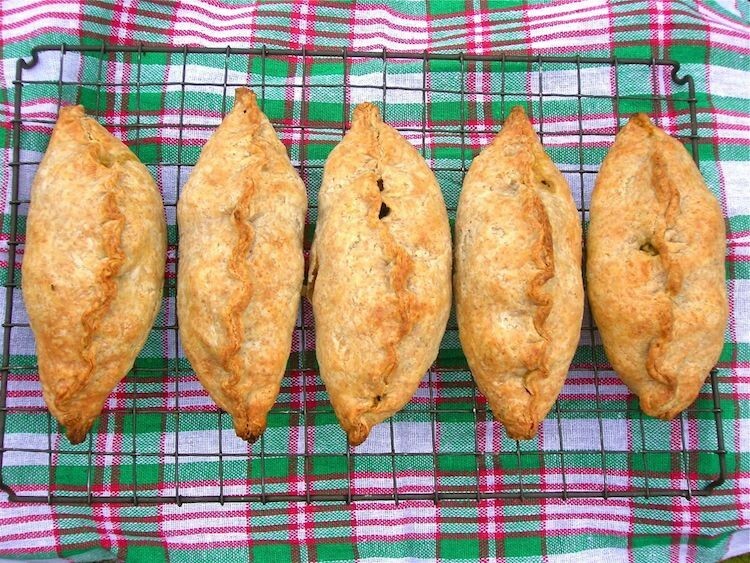 These look like proper traditional pasties… but I love the creativeness of the filling! Great flavour combo!! Looks fantastic! This will probably be part of my Halloween Menù, wow!!!! They would be fab for Halloween Claudia. Let me know how you get on. I am loving the filling, I bet the pumpkin and salty feta are perfect together. I love a good cornish pasty. I went to university in Exeter and we used to have a pasty van that would set up by the nightclub on a Monday night. My eyes ZOOMED into those pasties and POPPED! Gorgeous and simple to make too. Perfect recipe! I love your gourmet pasty! It sounds fantastic. Thanks for enterine #ExtraVeg! Wow, I’d never heard of a pasty until right now! They look sooooooo delicious! I love the use of the squash! Oh yes, I’m with you there Johanna. The other thing about a pasty is they are hopeless if warmed up in a microwave, they need to come from an oven so the pastry is crisp.